What are the consequences of globalisation for culture and cultural policy? Is there still a boundary between “domestic” and “foreign”? What challenges do cultural mediators face today? These questions were negotiated in cooperation with the Goethe-Institut at the Ninth Federal Cultural Policy Congress in Berlin. The many speakers and participants who gathered for the Ninth Federal Cultural Policy Congress in Berlin-Mitte agreed on one thing: political realities are presently forcing everyone working in the field of cultural mediation to re-examine their own points of view. Overcoming (cultural) boundaries, ever-greater openness and opening are being questioned. Brexit, the election of Donald Trump and invigorated nationalistic tendencies in many countries of Europe and the world have shifted the parameters. The organisers of the congress, Oliver Scheytt (president of the Kulturpolitische Gesellschaft e.V.) and Thomas Krüger (president of the Federal Center for Political Education), therefore consider “tapping into and explaining the global changes and upheavals for oneself and for others” the challenge for cultural and educational policies. Federal Foreign Minister Sigmar Gabriel also addressed the increasing isolationist tendencies, noting that liberal democracy is being confronted by a new authoritarianism, particularly in the exacerbating tones coming from the United States. According to them, foreign policy should be negotiated in a battle arena in which not right makes might, but the right of the strongest prevails, which is also resonating in the culture. Gabriel made the case for initiating a “Second Enlightenment,” one prerequisite for which is to consider the political fields of “domestic” and “foreign” as one. Overcoming boundaries is not just a mission faced by nations, but also by societies, explained political scientist Wolfgang Merkel using the example of the growing trenches between cosmopolites and communitarians: the educated and cosmopolitan versus those with a regional focus. Rubber-stamping these people, however, as “the losers of modernisation” is dangerous, Merkel warned. After all, they bear most of the social costs of change processes. In the ensuing discussion, Ulrike Guérot, professor of European Policy Studies, suggested the vision of a “European republic” which, as a common political body, could also solve the social problems. Klaus-Dieter Lehmann, president of the Goethe-Institut, confronted these theoretical constructs with the importance of concrete practice in cultural mediation, saying, “People have their own worlds of experience. That is where we must begin.” The Goethe-Institut is committed to overcoming boundaries through exchange and dialogue on the ground. “If, as in Turkey, we lose partners to political pressure, our work is at risk of becoming a mere export,” Lehmann said. Change processes, however, can only be initiated through common efforts. Overcoming boundaries also requires dealing with remembrance culture. Lehmann referred to the Future of Remembrance project initiated by the Goethe-Institut, in which Latin American countries are working together to process the consequences of military dictatorships and break the silence. Reflection of Germany’s past is part of this. 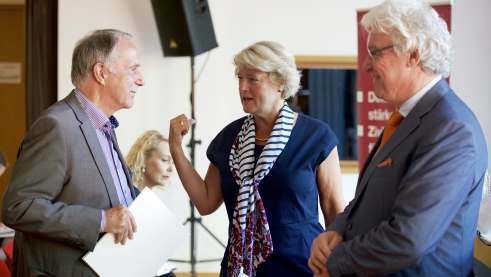 Klaus-Dieter Lehmann, Monika Grütters and Oliver Scheytt at the opening of the congress | Photo: Martin Becker Fotografie Does cultural mediation have representational gaps? Of course, the institutions must also face criticism. This insight was gained by the panel “Between the worlds – new challenges for cultural mediators.” Johannes Ebert, CEO of the Goethe-Institut, described the situation resulting from Brexit and the Trump election as a “restorative shock” because it accelerated the processes of self-reflection in cultural work. However, Nana Adusei-Poku, professor of visual cultures, argued that this applied above all to the “dominant society” whose own sense of security is being shaken. She accused the institutions of not being in touch when it comes to post-colonial discourse, for example. This led to a lively debate – that will certainly be continued – on representation and tasks in international cultural exchange. As Ronald Grätz, secretary general of ifa (Institute for Foreign Relations), put it, he sees his institution as an “echo chamber and seismograph” of upcoming developments.